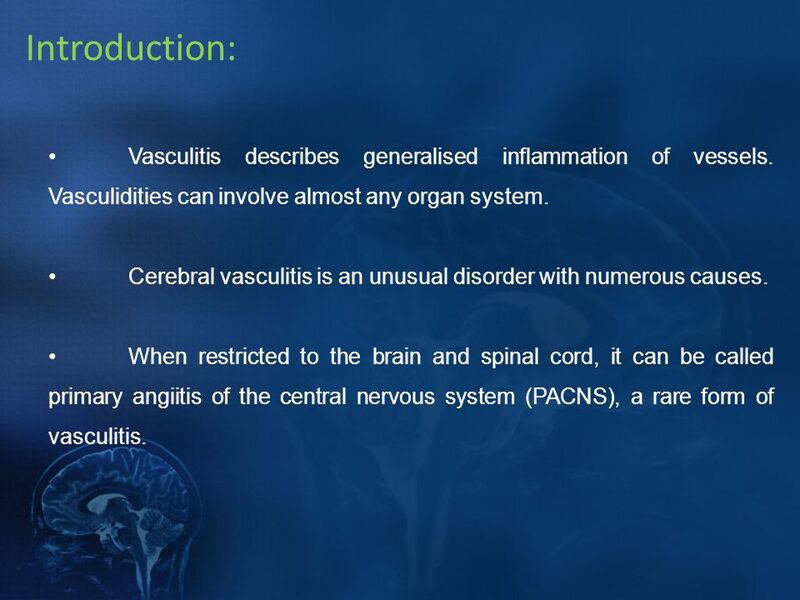 2 Introduction: Vasculitis describes generalised inflammation of vessels. Vasculidities can involve almost any organ system. Cerebral vasculitis is an unusual disorder with numerous causes. When restricted to the brain and spinal cord, it can be called primary angiitis of the central nervous system (PACNS), a rare form of vasculitis. 3 When affecting he central nervous system (CNS) it can lead to disruption of the normal structural and physiologic characteristics of the affected vessels, which in turn results in vascular occlusion and/or formation of aneurysms with consequent ischemia and hemorrhage. 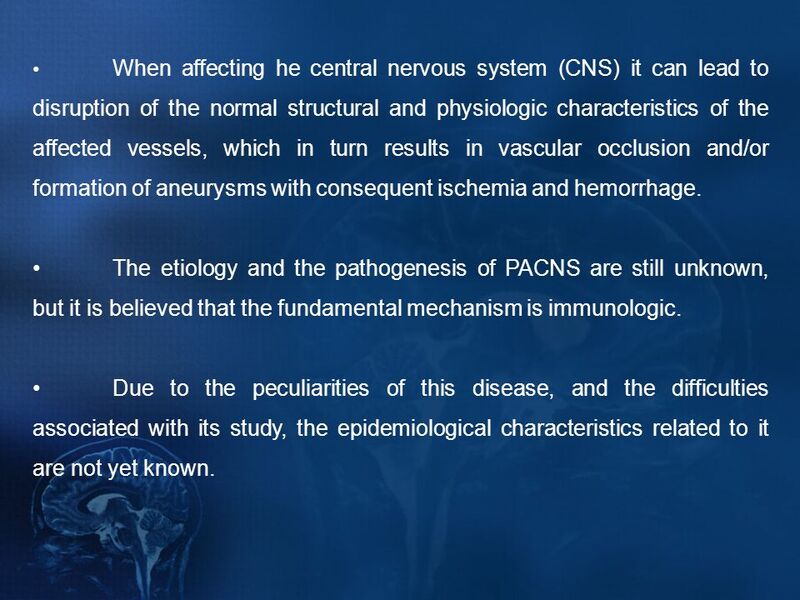 The etiology and the pathogenesis of PACNS are still unknown, but it is believed that the fundamental mechanism is immunologic. Due to the peculiarities of this disease, and the difficulties associated with its study, the epidemiological characteristics related to it are not yet known. 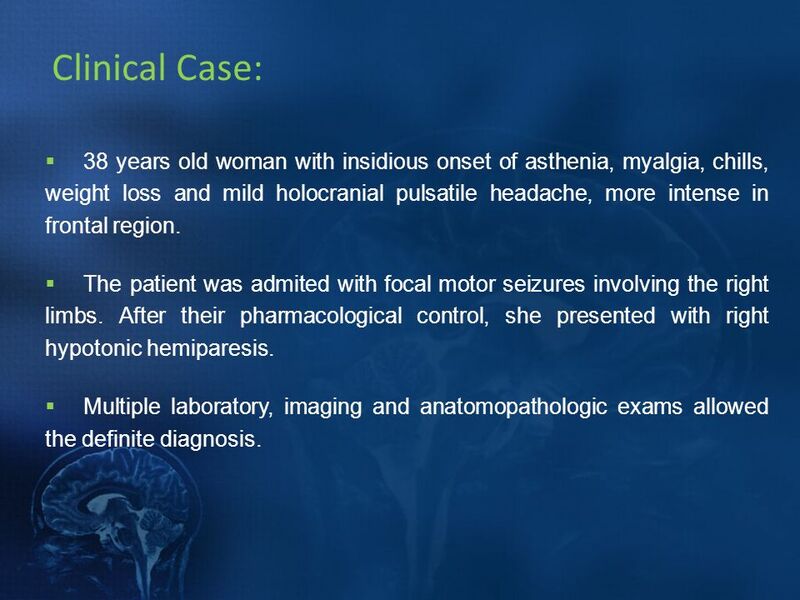 4 Clinical Case: 38 years old woman with insidious onset of asthenia, myalgia, chills, weight loss and mild holocranial pulsatile headache, more intense in frontal region. The patient was admited with focal motor seizures involving the right limbs. After their pharmacological control, she presented with right hypotonic hemiparesis. Multiple laboratory, imaging and anatomopathologic exams allowed the definite diagnosis. 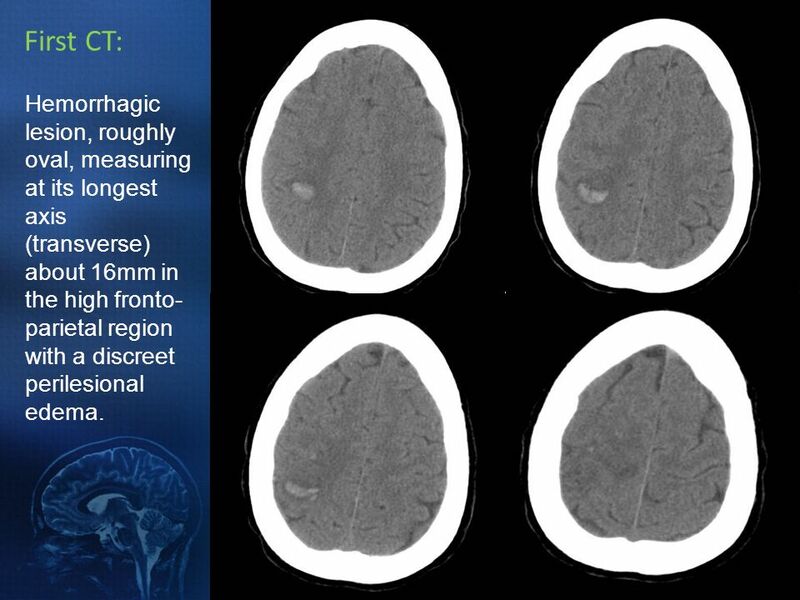 5 First CT: Hemorrhagic lesion, roughly oval, measuring at its longest axis (transverse) about 16mm in the high fronto-parietal region with a discreet perilesional edema. 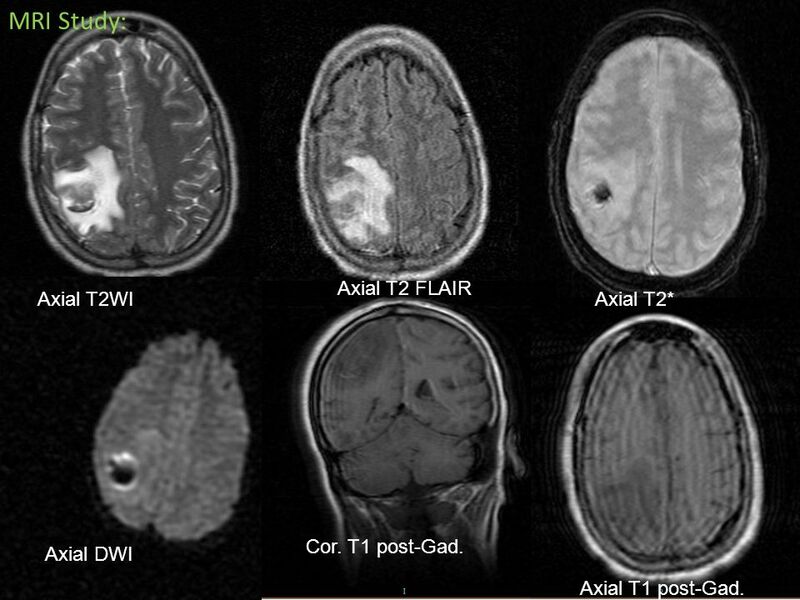 6 MRI Study: Axial T2 FLAIR Axial T2WI Axial T2* Cor. T1 post-Gad. Axial DWI Axial T1 post-Gad. 7 MRI depicted Intra-axial lesion, with acute hemorrhagic component, at the high right fronto-parietal region, roughly oval, measuring at its longest axis (transverse) about 16mm. It was surrounded by marked vasogenic oedema and presented heterogeneous contrast enhancement post-gadolinium. No other intra-axial areas of abnormal signal were detected. 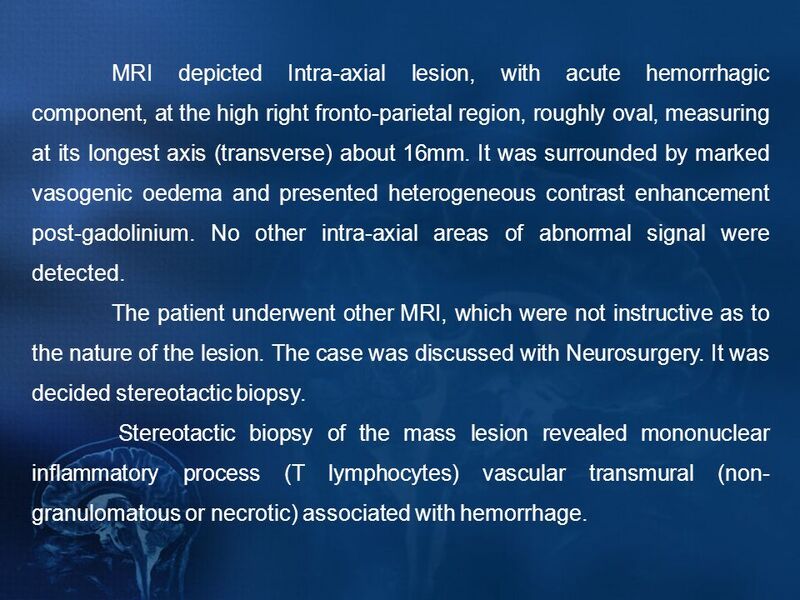 The patient underwent other MRI, which were not instructive as to the nature of the lesion. 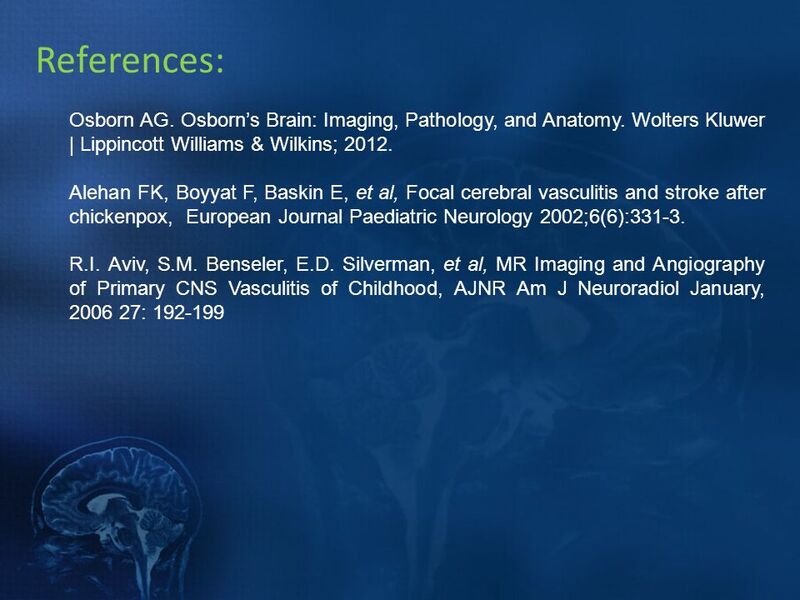 The case was discussed with Neurosurgery. It was decided stereotactic biopsy. Stereotactic biopsy of the mass lesion revealed mononuclear inflammatory process (T lymphocytes) vascular transmural (non-granulomatous or necrotic) associated with hemorrhage. 8 DSA: Not observed in the intracranial circulation segmental stenosis suggesting vasculitis. Small area, on the right, of "emptiness" vascular in relation to the region of the biopsy. 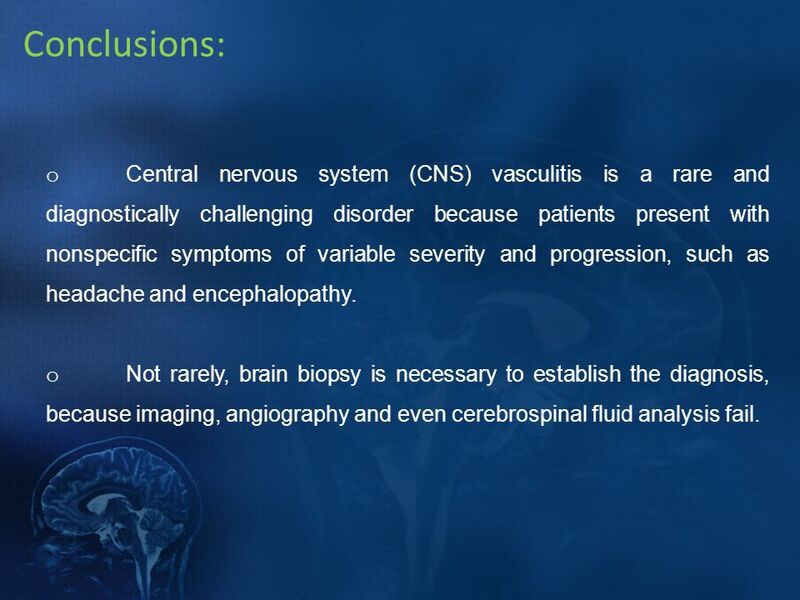 9 Conclusions: Central nervous system (CNS) vasculitis is a rare and diagnostically challenging disorder because patients present with nonspecific symptoms of variable severity and progression, such as headache and encephalopathy. Not rarely, brain biopsy is necessary to establish the diagnosis, because imaging, angiography and even cerebrospinal fluid analysis fail. 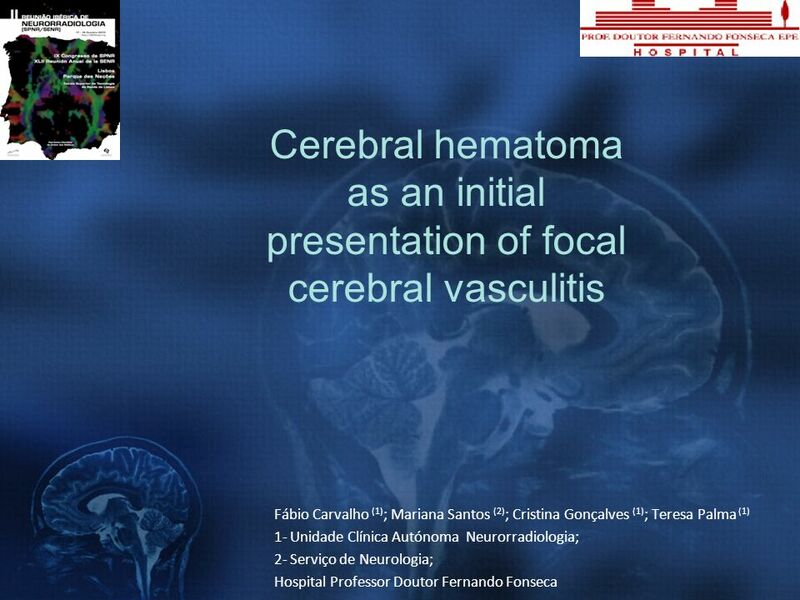 Download ppt "Cerebral hematoma as an initial presentation of focal cerebral vasculitis Fábio Carvalho (1); Mariana Santos (2); Cristina Gonçalves (1); Teresa Palma." Hepatitis C Associated with Polyarteritis Nodosa Bindiya Magoon, MD ACP Associate member, Elias Ghandour, MD, Good Samaritan Hospital, Baltimore, Maryland. CT Scan Reveals a mass that may or may not be enhanced with use of contrast medium. On CT, low-grade gliomas may be isodense with normal brain parenchyma. Dr R. Anjan Bharathi. 3 rd leading cause of mortality & morbidity. 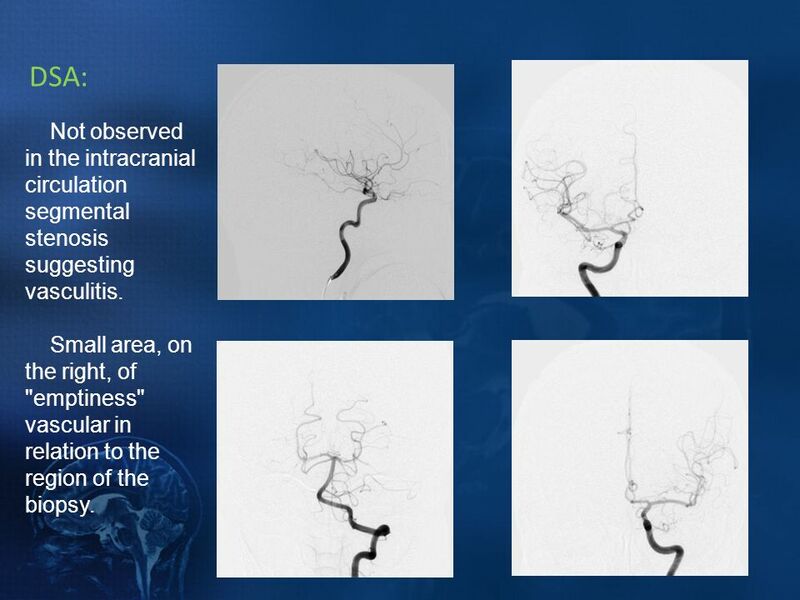 Goal of imaging Early and accurate diagnosis Information about the intracranial vasculature. A. HRICHI, S. KOUKI, M. LANDOULSI,R. AOUINI, I. GANZOUI, S.BOUGUERRA, Y. AROUS, H. BOUJEMAA, N. BEN ABDALLAH Radiology service, Main Military hospital. The differential for thunderclap headaches Neurology Resident Teaching Series. 63 year-old woman with subacute parkinsonism Teaching NeuroImages Neurology Resident and Fellow Section © 2014 American Academy of Neurology. J. Stephen Huff, MD, FACEP Transient Ischemic Attack Patient Update: The Optimal Management of Emergency Department Patients With Suspected Cerebral Ischemia. ABSTRACT ID: IRIA  51 year old male came with complaints of chronic headache.  He had 3 episodes of generalized seizures.  There is weakness. Cerebral Vein Thrombosis Morning Report Sima Patel 5/13/09.